Discover vibrant Barcelona. 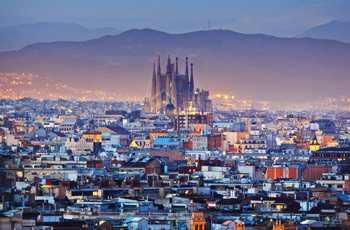 Delve into its arts, including the world’s best collections of Gaudi, Picasso, and Miro. Devour its cuisine: traditional Catalan or cutting edge. Stroll the historic streets, people watch, and explore the city’s countless boutiques, impressive food halls, and lovely beaches. Stay in a vacation rental apartment in the heart of the city's best shopping and architecture. Sights to see: La Rambla, Gaudi treasures like Sagrada Familia and Park Guell, the Picasso Museum, the Joan Miro Foundation, and more! Day Trips Located on the northeastern coast of the Iberian Peninsula, and known as “The Gateway to the Pyrenees,” Barcelona is surrounded by tranquil areas to wander and lovely beaches along the Mediterranean Sea. Sightseeing Wander the narrow streets in El Barri Gotic, or Gothic Quarter; stroll La Rambla and people watch; and visit the Eixample neighborhood to marvel at the whimsical masterpieces of Antonio Gaudi. Visit the Benedictine abbey at Montserrat or fly a kite at Park Guell. And don’t miss the Picasso Museum! Off the beaten track treasures that can’t be beat: Explore the back streets and medieval alleyways to find tapas bars and street musicians, flamenco dancers and classical recitals. One or two weeks in a personally selected apartment in the heart of Barcelona. 2-week Untour: Three 10-trip metro passes and an Articket Museum Pass (good for admission to 6 major city museums). 1-week Untour: Two 10-trip metro passes and an Articket Museum Pass. Local information and our Untouring Barcelona guidebook, researched and written by Untours staff, full of insider tips, restaurant recommendations, and sightseeing information. A local cultural event, like a guided tour of the Santa Caterina food market followed by a tapas lunch.